"Now, nearly 14 years on, I look back and think how grateful I am for all those who supported me throughout such a harrowing time of my life. I’m lucky in that I had the perfect support network, but I know that not everyone is that lucky. And that’s where organisations like Cancer Council play such a vital role." 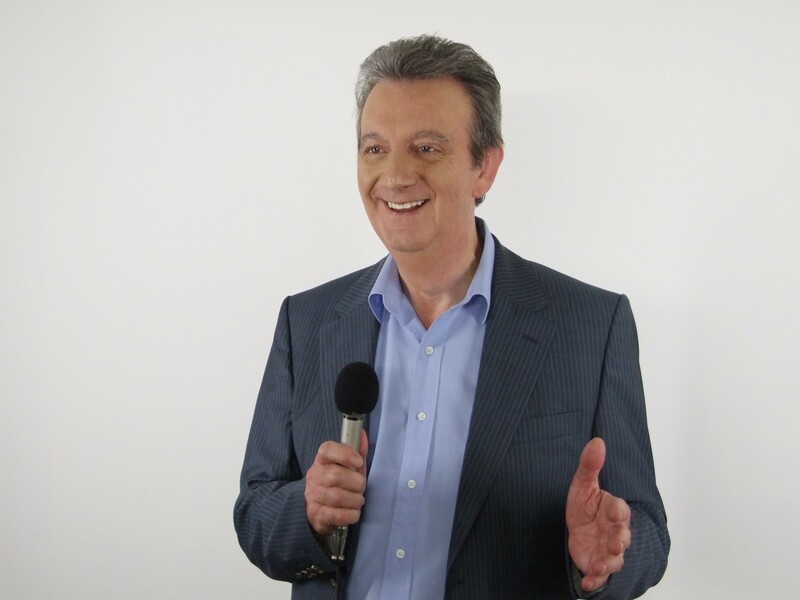 When Graeme experienced sudden chest pain one night after reading the nightly Channel Seven News back in 2004, he was rushed to the hospital. Several tests later—deemed just a precaution—he was diagnosed with Stage 3 bowel cancer. Graeme was fortunate that his treatment and recovery was over in 12 months, and he has since become a passionate bowel cancer advocate. 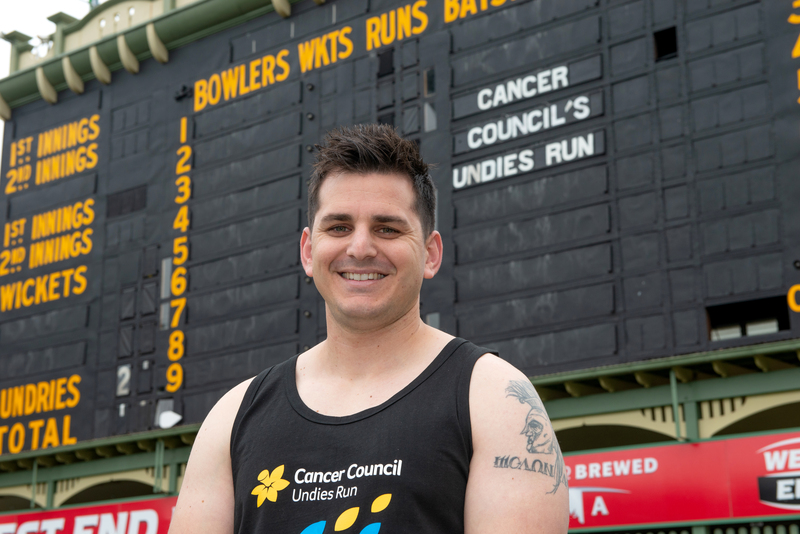 He now joins the ranks of Cancer Council’s Undies Run 2019 to raise funds for research and spread the message even further—that the 10-minute bowel cancer screening test saves lives. Join Grame at the Strikers and register today! In September 2015 Dimitri Sarris was just 27-years old when he was diagnosed with aggressive, stage 3 bowel cancer. What followed was a barrage of treatments, including chemotherapy, radiotherapy and eventually a colostomy, which saved Dimitri’s life. Now, nearly four years on, Dimitri is proud to say that his life is getting back to normal. “This year’s event will be taking part in front of 40,000 people which is an amazing opportunity to spread awareness and raise funds. To have the Strikers involved and supporting the event is really special. I can’t wait!" Dimitri’s message to others is simple. Come down, have fun and do something silly, all while remembering that the event underscores a serious issue. "The event is important as it puts a positive and funny approach to what is perceived as a taboo topic - Bowel cancer." Dimitri will join 200 dedicated fundraisers at Cancer Council’s Undies Run, held just minutes before the opening delivery of the Adelaide Strikers v Hobart Hurricanes BBL match om Monday, 21 January. "Hopefully the money we raise will ensure that fewer families have to experience watching a family member go through bowel cancer in the future.” - Phillippa. Sisters Phillippa and Georgette Radford will be joining 200 passionate South Australians this January to bare it all and knock bowel cancer for six. This year the event will be even more special for the sisters, with their mum re-diagnosed with bowel cancer earlier this year. The sisters are hoping that the money they raise will go towards bowel cancer research, and ultimately ensure that not one has to go through a cancer journey like their mum. “Through research we will be able to understand more about bowel cancer and improve detection, treatment and outcomes." Phillippa Radford. 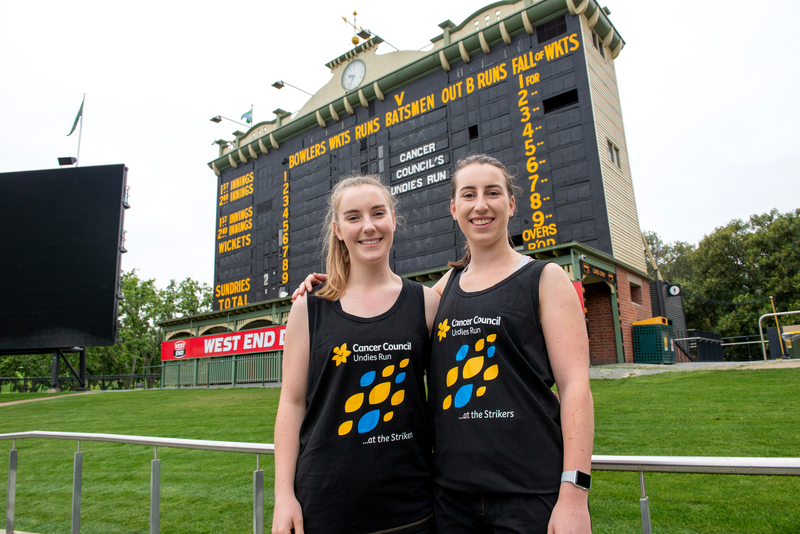 Join these incredible sisters at Cancer Council's Undies Run and help them knock bowel cancer for six!